Our retail and landscaping center is located at the junction of Hwy 59 & East Lake Lizzie Rd. North of Pelican Rapids. 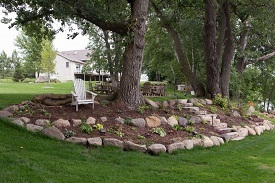 We proudly provide our customers with everything from bulk ornamental stone, mulches, compost, top soil, trees, shrubs, annuals, and perennials. We also offer a great selection of bagged mulches, soils and fertilizers. We strive to be a true one stop full service landscaping and retail center, our knowledgeable and friendly staff can help you solve just about any problem. We can also help you find the perfect plant or tree for any situation.